Masters of Dance and Music is a plethora of style, spirit, grace and the boldly new. 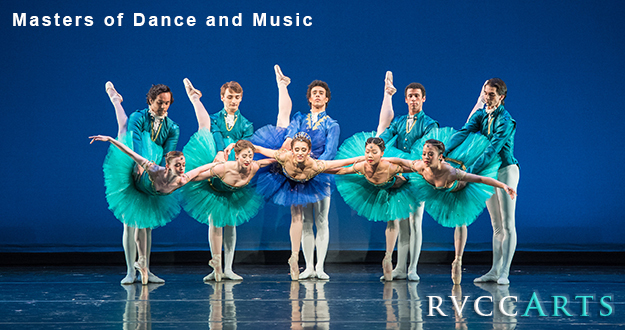 The program begins with Glazunov Variations, a highly technical work danced to sections of composer Alexander Glazunov's magical score for the classical ballet Raymonda. Highlighting this unique program is Scarlet Sonata a new world premiere by American Repertory Ballet Resident Choreographer Mary Barton. The program finishes with the much-loved There is a Time, a deeply evocative work by modern dance pioneer and choreographer José Limón. Based on Chapter 3 of Ecclesiastes ("To every thing there is a season, and a time to every purpose under heaven"), this majestic dance evokes rich feelings from the audience as it reflects the human condition and interminable passage of time.